If you look around at the rooftop solar installations, you’ll notice that the solar panels aren’t actually part of the roof — instead, they’re set on structures resting on top of the roof. That seems like a waste of materials. Dutch designer Ruben Beijer from Stafier Holland bv came up with an ingenious design for a new type of rooftop solar array in which the solar panels replace the roof tiles and serve as part of the roof structure. The PV Premium photovoltaic in-roof system seamlessly integrates with existing roof tiles, opening up new possibilities for integrating solar technology with architecture. Since 2001, Dutch company Stafier Holland has been developing a new type of rooftop solar panel that looks and acts like a roof tile. Current rooftop solar panels are slightly elevated from rooftops, making it difficult for architects to integrate them into existing rooftops. These new solar tiles solve that issue, and they can be used in both new buildings and existing structures. The panels fit so seamlessly into existing roof tiles they are virtually invisible. 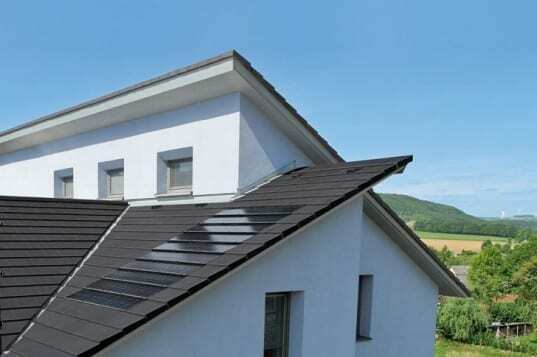 April 16, 2019 - The latest on solar roofs, solar shingles and solar tiles Solar Power WorldThere are many words used to describe unconventional solar PV technologies used on rooftops. Within the "building-applied" category — basically anything. April 9, 2019 - Hanergy preps for global launch of new CIGS thin-film solar tile Solar Power WorldHanergy Thin Film Power Group announced a collaboration with CSR Group, the largest roof tiles producer and roofing solution provider in the Southern. April 10, 2019 - Hanergy joins rooftop solar tile market, in partnership with Australia's CSR Group RenewEconomyChina-based Hanergy unveils thin film solar tile offering with a firm eye to the Australian market – and a design hat-tip to a bizarre Queensland landmark. September 7, 2018 - CIGS thin-film manufacturer Sunflare to debut solar shingles at SPI Solar Power WorldSunflare will debut easy-to-install, aesthetically-pleasing residential solar shingles at Solar Power International 2018 in Booth No. 2482. Sunflare.